Blend any 2 of your photos into a single photo to create a fantastical magical blend effect. 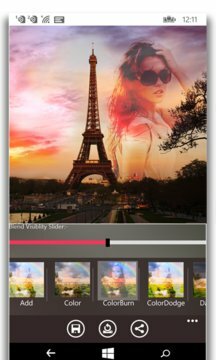 Photo Blender is a simple but powerful app, it blends two of your images into a single image. A transparent overlay of the first photo taken can be overplayed on another photo taken from gallery or camera. - Select any two pictures. It can be two pictures of same person in different poses or pictures of two different people. - Adjust blend level with ease. 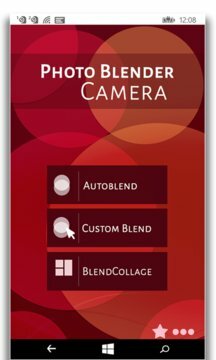 - Save and share the Blended Photos on any social networking platforms. - Blender Camera is simple to use and has a pleasant interface. - Fantastic filters you can apply to the blended images. We have added custom blend feature which is fully loaded, you can select 2 images of your choice to blend, and you can increase or decrease the opacity of individual image as well. You can crop the images as per the ratios. There are multiple backgrounds you can apply which gives a classy look to your images. Unique filters you can apply too. Add text to your images to keep your memories alive forever.